In last week’s post, we spoke of how anyone at any age can learn a foreign language as long as they adopt a positive mindset from the outset and begin their language learning journey with a keen and genuine interest in their target language and its culture. Whether you are learning English, Chinese, or Korean with us here at Q Language, or studying another language somewhere else in the world, here is another simple language learning mindset tip to help ensure you are successful in mastering the foreign language of your choosing. Everyone has his or her own reasons for learning a foreign language. Some need it for their job, while others believe it will help them to enjoy a better experience when travelling to foreign countries. Some people desire a better understanding of their ancestral past or just want to be able to speak with friends and family. Whatever your reason, you must get specific about your ‘why’ – the reason you want to study the language. 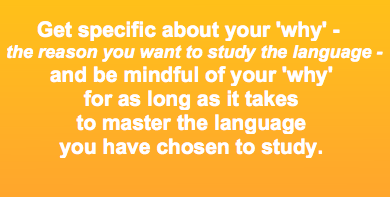 You should also be mindful of your ‘why’ for as long as it takes to master the language you have chosen to study. 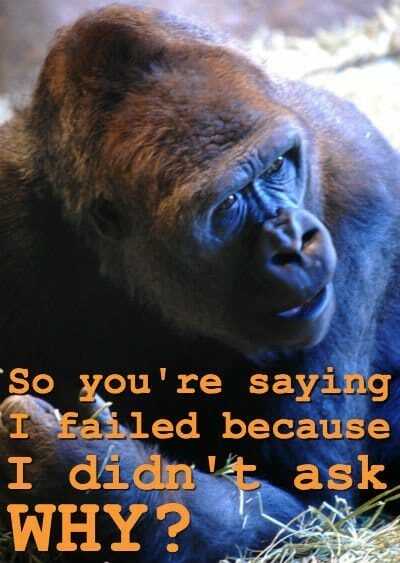 If you don’t get very specific as to why you want to learn a new language you are setting yourself up for failure. The more detailed and specific your ‘why’ is, the more likely you are to stay motivated and enjoy studying the language. Ultimately, this will lead to success. If, for example, you ask yourself, ‘Why do I want to learn Mandarin Chinese?’ and your answer is that it will help you in your career, you are not being specific enough. If in your mind this means that you will put yourself in a position to state on your resume that you can speak Chinese and that this might be attractive to some employers, which might stand you a better chance of getting some jobs, that is just not good enough; it is far too vague! Yes, you might maintain focus and motivation long enough to learn Chinese and you might end up proudly displaying the fact on your resume and some employers might be impressed and might employ you because of it. However, I doubt it! There are way too many ‘mights’ and the might trail runs right back to your unspecific ‘why’! 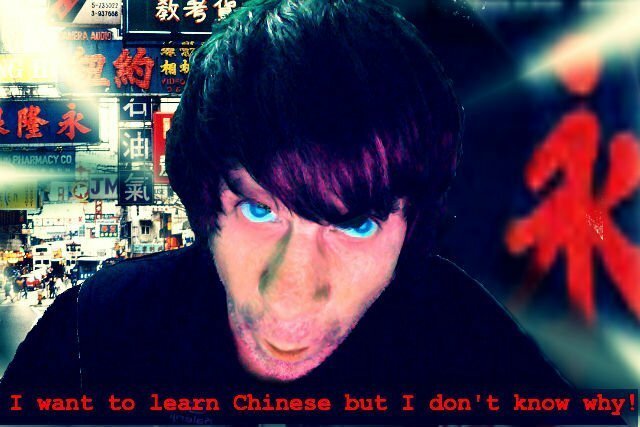 Example question: Why do I want to learn Mandarin Chinese? I want to learn Mandarin Chinese because it is common knowledge that companies worldwide are crying out for native English speakers (replace English with your native language if your native language is not English) who are also fluent in both spoken and written Mandarin Chinese. If I add Chinese fluency to my list of skills, qualifications and experience it is highly likely that I will secure a job with a renowned global organisation. This will secure my financial future and win me respect and admiration from my family and my peers. Also, I’ve always wanted to travel and work in China to fully understand Chinese people and Chinese culture, and learning Chinese is a vital stepping-stone to realising both dreams. My current employer has offered me a fantastic opportunity in Hong Kong with a substantial pay rise if I learn to speak Cantonese Chinese within the next 6 months. The promotion would be an opportunity of a lifetime for my family and myself. We will be much better off financially and my wife and children will get to experience living abroad for the first time ever. This will make us all very happy. Note, neither one of the examples above guarantees success in either mastering Mandarin or Cantonese Chinese, nor does it guarantee a positive step up on the career ladder. However, the ‘why’ is clear and specific; it is not vague. Both examples state well-defined reasons and, most importantly, attach the emotional benefits of achieving the goal of learning the language. Humans are, by nature, emotional. Of course, we are also highly intellectual, but ultimately we are always driven by our emotions. If a language learner focuses too much on the process of language learning – which throws up numerous challenges – without staying in touch with the emotional reason (the ‘why’) they decided to learn the language in the first place, it is easy to become deflated, demotivated and even give up when the going gets tough. We can all follow a process or a system for a period of time, but without an emotional attachment of the desired outcome, we will eventually burn out. Instead of being passionate about our goal, we can come to regret it. Get specific about the reasons, the purpose and the emotional benefits of learning your chosen foreign language and at regular intervals throughout your language study remind yourself of your ‘why’. Do this and you are more likely to succeed! Please leave us a comment below and tell us the reason ‘why’ you are studying a foreign language. Life would be easier if we alls spoke the same language!